Well, I decided that although worn, our garden boxes had a few more years in them. So, I rearranged them, put them closer together and was able to add 3 more 4x4 boxes and a 3x13 box for a total of 199 square feet in the back yard (231 if you count the strawberry bed). So far we have planted garlic and onion sets. . . 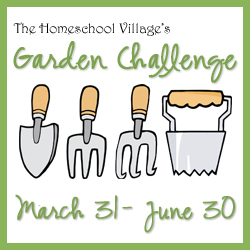 I used the end of the hoe to punch holes in the soil and let the little ones place the sets in the ground, pointy side up ~ 4 per square foot for onions and I originally had 5 per square foot for the garlic, but we had a few extra, so I made room (much to my little ones' delight). I've read that some go up to 9, but I wanted to be generous with the spacing, hoping for larger bulbs. Trying to organize the craziness and decide what to plant. Last year, I used a light hut on a table in the dining room and it worked wonderfully. This year, I cleaned out the mud room (which has windows on three sides), set up a table and hung a plant light... it does not stay as warm as the dining room because the kids are always leaving the back door open, but it will hopefully warm up soon. And it will be super easy to harden them off ~ all I have to do is open the big windows and the door during the day for a week, and then day and night for a few days ~ no more carrying trays and trays of starts outside and in, over and over again! We have a known squirrel problem. To keep them away from digging in my onion/garlic bed we covered them with netting and we called the city to have them set traps. We have also had some inclement weather (snow and rain). Jordan's 1-ton broke down on the way home from getting the compost. We towed it home and thought we had it running, so we loaded it back up with our green waste pile (in our town, you can exchange green waste for compost at the landfill), but we never made it. I need about one half of a ton more compost. Luke's starter is out on his truck up at the property, and our 1-ton (a '72) needs tires. So, we borrowed the Y truck to get the cattle panels for the fence. I have a while before I can plant anyways, so there is time. Also, vermiculite doubled in price this year and I wasn't willing to pay $60 for a bag that I used to pay $20 for a few years ago. I was willing to fork out $30 last year, but not $60. So, I'm not using "Mel's Mix." Just compost and peat moss. That buying the trays and inserts from a local greenhouse, is more economical than buying seed starter kits. I'm looking forward to living vicariously through everyone else's gardening posts and dreaming of what sunny days may bring after all this rain! Oh I'm trying not to covet your new square foot garden beds! :) I really, really want to put 2 new ones in at home. Not sure it's going to get done though. I hadn't priced Vermiculite here yet. Yikes! That is expensive! I paid about $25 for a huge bag a couple years ago. oo look at all of those beds just waiting for the weather to cooperate!! Yay!! Thanks for joining us and linking up !!! Your garden area looks wonderful! It is so great to see the kids involved with the garden! I pray you have many bright sunny days to geminate all those wonderful seeds! 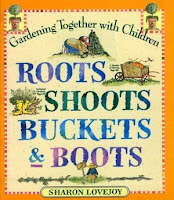 Gardening with Children is another great resource for some science oriented gardening. LOVE all your raised beds! Happy Gardening! I am dreaming of an indoor seed starting area like yours, lucky girl! Awww I love this....We are starting some other stuff sunday, I hope!! I still not feeling it...but I am so glad/excited to see all your seeds...!